This was the tournament of Total Football, a showcase for the majestic talents of Johan Cruyff and Franz Beckenbauer, who shone in the spotlight vacated by Pele, leading their respective Dutch and West German sides through to a Final showdown in Munich on 7 July 1974. As against Ferenc Puskas's Magnificent Magyars 20 years earlier, it was West Germany who emerged triumphant, coming from behind to claim their second world crown at the expense of the favourites. It was a Final that began in sensational fashion. The Netherlands, who had scored 14 goals and conceded just one in six games previously, went in front before the Germans had even touched the ball. Cruyff, the waif-like wizard in the No14 shirt, set off on a dribble from the centre circle, stopped only by a foul from Uli Hoeness in the penalty box. The first spot-kick in a FIFA World Cup™ final. With little over a minute on the clock, Johan Neeskens made it 1-0. The Dutch were toying with their rivals like a cat with a mouse but on 25 minutes the Germans, their pride piqued, regained parity as Paul Breitner converted another penalty after Bernd Hoelzenbein had gone down under Wim Jansen's challenge. 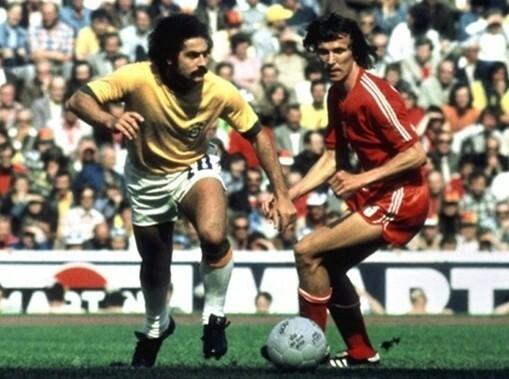 With Berti Vogts managing to contain Cruyff, Gerd Muller, Golden Shoe winner four years earlier, then ensured West Germany's name would be the first etched on to the new FIFA World Cup Trophy when, two minutes before the break, he turned on a Rainer Bonhof cross and shot low past Jan Jongbloed. The solid-gold statuette that West Germany captain Beckenbauer held aloft, a replacement for the Jules Rimet Cup that Brazil had retained after 1970, was not the only novelty of Germany 1974. There was a new FIFA President in the Brazilian João Havelange, who had taken the place of Englishman Sir Stanley Rous. Moreover, there was a change of format, a second stage comprising two groups of four replacing the traditional knockout route of quarter-finals and semi-finals. England and Russia were prominent absentees – the former failing to qualify for the first time, the latter refusing to travel to a play-off in Chile on political grounds. Of the newcomers, East Germany made the biggest impact, upsetting their western neighbours 1-0 in Hamburg in the first round. Jurgen Sparwasser's 77th-minute strike meant the East Germans advanced as group winners, above Helmut Schoen's hosts. 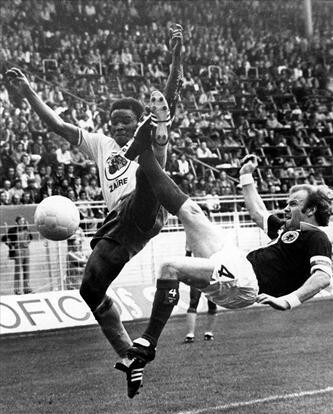 Zaire – the first finalists from sub-Saharan Africa – provided the funniest moment when, in their game against Brazil, defender Ilunga Mwepu ran out of the defensive wall and booted the ball away, before an opposition player had even touched it. Meanwhile, Haiti – who had profited from hosting the final qualifying round in the North, Central American and Caribbean Zone – took a surprise lead against Italy in their opening match before succumbing 3-1, the first of three reverses for a team hampered by the subsequent loss of Ernst Jean-Joseph after a failed doping test. West Germany made a shaky start, internal disagreements over bonuses giving way to unconvincing displays in the first round, where they earned jeers from their own supporters during a 3-0 win over Australia. Yet the defeat by East Germany did the reigning European champions a favour for they avoided facing the Netherlands, Argentina and Brazil in the second stage. Instead they overcame Yugoslavia and Sweden before winning their decisive final pool match against Poland. Muller got the only goal on a rain-drenched Frankfurt pitch though Sepp Maier's saves at the other end proved equally decisive against the tournament's surprise package. The Poles had raised eyebrows by eliminating England in qualifying but now they found a new level. With the midfield drive of Kazimierz Deyna and scoring threat of Grzegorz Lato – the seven-goal Golden Shoe winner – and Andrzej Szarmach, who hit five, they beat Argentina and Italy in the first round before then getting the better of the Swedes and Yugoslavians. They deservedly took third place at Brazil's expense. The Brazilians were a shadow of the side that had triumphed in Mexico. 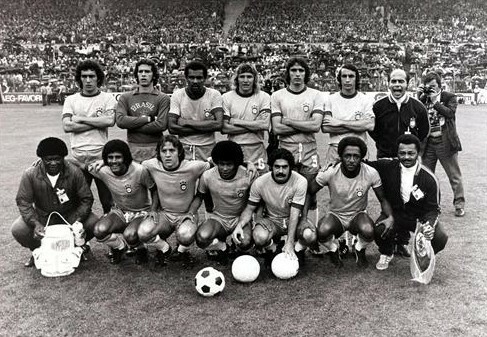 They edged past Scotland – the tournament's only unbeaten side, ironically – on goal difference in the first round and despite defeating Argentina in the South Americans' first-ever FIFA World Cup meeting, they were denied a final place by a 2-0 loss to the Netherlands, Neeskens and Cruyff each scoring a fine goal. This was the first FIFA World Cup since 1938 for the Oranje but, having also swept aside Argentina 4-0, they were now favourites to go on and win it. With the brains of coach Rinus Michels and brilliance of Cruyff, who had together brought glory to Ajax before departing for Barcelona, they would have made worthy winners. Yet West Germany had their own visionary in Beckenbauer, the man who revolutionised the libero's role, and their ability to rise to the occasion told when it mattered most.